The International Human Rights Clinic involves students in international and domestic litigation designed to enforce international human rights norms and establish precedents for future litigation. The primary goals of the litigation are to use international human rights norms within the U.S. legal system and to address international human rights violations committed by U.S. actors. Six students from UCI Law’s International Human Rights Clinic helped clinic Director Paul Hoffman prepare the Oct. 1, 2012 U.S. Supreme Court oral argument in Kiobel v. Royal Dutch Petroleum, a key case involving alleged oil company abuses in Nigeria. Clinic students participated in the briefing and preparation for arguments in Kiobel v. Royal Dutch Petroleum Co. in the United States Supreme Court in February and October 2012. Students were involved in every aspect of the case, including research and drafting, and attended moot court sessions and the arguments in the Court. 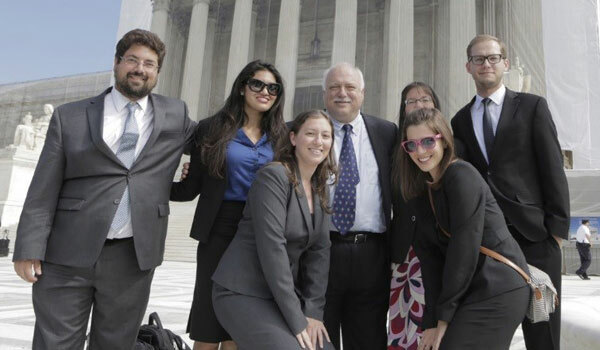 In the Fall 2013 semester, clinic students participated in the briefing and preparation for argument in the D.C. Circuit in Janko v. United States, a case on behalf of a former Guantanamo detainee for damages for torture and prolonged arbitrary detention. During the Fall 2014 semester, the students prepared a petition for a writ of certiorari in the case.